Centrally located in downtown Seattle. Our new location is conveniently located at First Ave. and Pike Street, right around the corner from our old Hostel, and across the street from the famous Pike Place Market. The new hostel, with a view of the Puget Sound and the Market, boasts 30 newly-remodeled bunk rooms in the elegantly restored Elliot Hotel Building, which once served as short-term housing for loggers, dock workers, and Miners who came to Seattle in the early 20th century. The beautiful historical building has plenty of modern charms too: European style bath and shower rooms are brand new, as are the kitchen and common areas. We are within easy walking distance of restaurants, shops, The Pike Place Market, The Space Needle, The Experience Music Project, Pioneer Square, and more. Plus, we have. Free Breakfast, including fresh baked brownies, make-your-own waffles, fresh fruit, eggs, toast, butter, jam and honey. The Green Tortoise's accommodating staff can arrange tours to explore the city or make suggestions for independent travel. An extensive information board lists what to see and do and how to get around. Pike Place Market is famous for fish-throwing, fresh local produce, bakeries, flower shops, cafes, the original Starbucks location, and dozens of ethnic food stalls and restaurants. This colorful neighborhood is also one of the city's safest, and our hostel is a close walk to such famous landmarks as Seattle Center (where the Space Needle and the Experience Music Project *AKA the Jimmy Hendrix museum * are located), Pioneer Square, the Waterfront, the Washington State Ferries to nearby communities, Capitol Hill, and Queen Anne. Coming to town for a live music show? Come check us out -- we're located pretty much in the heart of the live music scene with venues like the Crocodile Cafe, the Showbox Theater, the Paramount Theater, and the Moore Theater all just blocks away from us. The Green Tortoise Hostel offers the best value for your dollar. All of our prices include taxes. We also offer free breakfast, 9 free high speed Internet access terminals, and free dinner on Tuesdays, Thursdays and Sundays. We also sell discounted tickets for the Woodland Park Zoo and the Experience Music Project. The Green Tortoise Hostel has an age restriction and cannot accommodate minors (under 18 years old) in dorm rooms. Minors traveling with adults must book a private room. If you have any questions about this policy or would like to explain your circumstances, you must contact us directly. The World Famous Green Tortoise Adventure Travel began over 30 years ago, with a hostel on wheels and the realization that beautiful places, great food, and sociable people were the only essentials for gratifying travel experiences. The Green Tortoise hostels in San Francisco and Seattle are built on this fine tradition. The Green Tortoise San Francisco and Seattle hostels are created around a social communal experience. Great showers, individual use so no gang shower style here! All beds come with a reading light, fan, oversize locker underneath, great pillows, quality mattress and soon to come, privacy curtains for your microhabitat!! 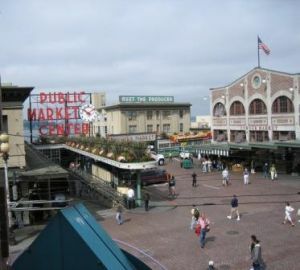 Our location is cross corner from the Pike Place Market, Pike Place Market is famous for fish-throwing, fresh local produce, bakeries, flower shops, cafes, the original Starbucks location, and dozens of ethnic food stalls and restaurants. This colorful neighborhood is also one of the city's safest, and our hostel is a close walk to such famous landmarks as Seattle Center (where the Space Needle and the Experience Music Project *AKA the Jimmy Hendrix museum * are located), Pioneer Square, the Waterfront, the Washington State Ferries to nearby communities, Capitol Hill, and Queen Anne. Cash, Mastercard, Visa and Traveler's cheques accepted. Dorm beds require a 48 hour notification of cancellation. Private rooms require a 72 hour notification of Cancellation. From the airport: take bus 194, or 174 (infront of the luggage claim area) to 4th and Pike. Walk down 3 blocks to 105 1/2 Pike Street. From the Greyhound: walk 6 blocks toward the water on Stewart to 1st Ave. Turn left and go 2 blocks to 105 1/2 Pike St.
From Amtrak or greyhound just take a cab - keep your reciept & we will refund $2/person off your first night's rent. Make sure the cab uses the meter. We are on great local bus lines going all over the city. Our location is central to the downtown area, Pike Place Market is across the street and easy walking distance to distance transportaion hubs.